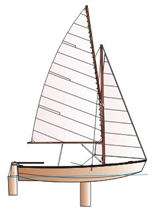 Hull length: 3.65 m Hull width: 1.4 m Draught: 0.15 / 0.80 m Sails area: 7 sq. m Mass of hull: 85 kg Crew: 3 persons Designer: Marek Jankowski M. Eng. Robinson is a small recreational yacht. The hull is made of plywood by "stitch and glue" method. This technology reduces significantly the amount of work as compared with traditional methods, and makes the work easy even for a beginner shipwright. Robinson has gaff rig with aluminium spars and wooden dagger board, which simplifies the construction even more and additionally reduces the cost. The design for "Robinson" was developed in 1982 as "Froggy" and was offered as plans - since then tens of such yachts were built, confirming that it is easy to build and has good sail abilities. Now, our company offers the boat as complete sets for self build. We changed construction name for "Robinson" and made it more simply. CNC technology cuting guarantee excelent precision and parts fiting. Robinson composition is easier than puzzle, becouse set is equiped with detailed, rich illustrated instruction, which let build own sailboat even to beginner DIY man. There is needed only a basic toolset and driller. Total build takes about 80 working hours. In order to see assembly stages click here. Robinson complete set is delivered in three boxes, which you can order separately during the build time, or all together – saving the costs. Additional box contains chemical articles like glue, resin, varnish etc, needed for building the boat. You can order it by us or use chemicals from other supplier. Robinson is made of plywood - 6, 10 and 18 mm thick, center board and spars are made of aluminium , sails of dacron, wires of steel and hardware - steel and plastic. A – whole boat made of pure birch plywood – for colour painting, exept tiler and guard rails made of exotic, water resist merbau wood, which can be varnished. B – hull, center board and rudder yoke made of plywood – for colour painting, and deck, cockpit, and centerboard case – made of plywood covered with merbau wood – for varnish finishing, similar like tiler and guard rails. C – whole boat of plywood covered with exotic merbau wood – for varnish finishing, also tiler and guard rails. box 1 – complete elements and parts for building the hull with hardware, rudder device and centerboard. box 2 – spars: mast, gaff and boom. box 3 – sails with cover and accessories - lines, blocks, shackles etc. box 4 – complete chemicals articles – glue, resin, glassfiber mat, poliuretan foam, varnish, lacquer colour, thinners, gloves, jugs, feeders, masking tapes. Box no. 1 is available in three versions depending on chosen yacht version: 1A, 1B or 1C. Boxes no. 2 and 3 contain finished, complete parts, ready to instal on a boat. Box no. 4 can be ordered also in three versions, like box no.1, depending on yacht version. In versions 4A and 4B there is six colours available for painting the hull. In 4A version the deck is always white (RAL 9016). Available colours for hull painting: white (RAL 9016), yellow (RAL 1023), red (RAL 3000), navy blue (RAL 5003), blue (RAL 5015) or dark green (RAL 6005). Boxes are solid packed and delivered by transport company. There is also possibility to take them personaly.